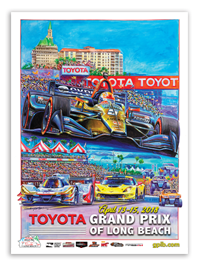 Your ad in the official Acura Grand Prix of Long Beach event program is certain to catch the attention of many thousands of race fans – more than once – as they enjoy the colorful, informative program that, annually, ranks as a prized racing collectible! Don’t miss this cost-effective way to place your product or service in front of your target audience at the circuit AND at home! Artwork received not to specifications, non-camera-ready or containing errors will be modified at client’s expense. A standard 15 percent agency commission is allowed to recognized agencies. Discounted rates provided to those purchasing advertising space in BOTH the Souvenir Program and Fan Guide. Download information on Souvenir Program ads here.